So, so, so…in the finishing paragraph of my review for Iced Earth’s previous offering, Framing Armageddon, I was more than anticipating the second half that would complete the Something Wicked-saga introduced over ten years ago. Of course, last autumn I had no idea of the now fully experienced marvel – the return to the fold of my favourite metal vocalist of all time, Matthew Barlow. I decided to stay as brief as possible with my exclamations on this subject. Yes, it is a most joyous occasion to have him on an Iced Earth-record and yes, he still owns you, me, your classically trained friends and even Warrel Dane. The years in law enforcement have not taken anything away from Barlow’s capabilities as a singer as I could easily be fooled into thinking his performances on this album have been replicated from any point in his career within the past 15 years. He can go gruff and he can wail like a beast. The red-headed master is back with unspeakable power. OK, so Barlow still rules and I’m still an annoying-as-ever-fanboy, we got that? Good. This album rules too. After digesting Framing Armageddon, I was expecting that the atmospherical quality of that album would be contrasted by a manic, speedy, destruction-by-sheer-hysteria -kind of execution. But such is not the case. 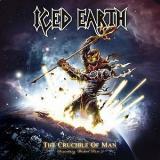 As with it’s predecessor, The Crucible of Man is a different album from all previous Iced Earth-works. It takes the often mournful, thoughtfully crushing vibes of the previous album and augments everything to another degree. The “Choir of Sacred Fire” is featured well throughout the album and its performances are brilliant. The opening “overture”-like piece, In Sacred Flames, sets the tone with soft acoustic guitars and a gentle vocal melody, until bringing in the bass voices and distorted guitars start churning a maelstrom that chills the mind. A great transition is made into the fast riffer of Behold the Wicked Child, a sure-fire crowd-pleaser for the new tour sets. From there on out, the evolving story of Set Abominae takes over and the music most of all supports the large story arc with several mood swings and changes in tempo, both musical and emotional. A large part of the album is taken by mid-tempo songs with riffs galore that don’t often jump at your jugular, but slowly and surely roll over you in a wash of heaviness. Matt Barlow’s voice adds to this effect of course, as his emoting the events of the characters is still unbelievably strong. Those craving for many fast thrashers (those who should love Divide Devour) might be disappointed at first as while there are quick, galloping riffs to be found, they are almost to a fault the shortest songs on the album – not short enough to be remarked as just interludes, but from two to three minutes tops, like The Revealing or The Dimensional Gauntlet. I’ll admit that I would have preferred those tunes longer as well, so there would be more fast riffing, but when the mid-tempo is done this well, I don’t really mind. Songs like I Walk Alone, Minions of the Watch, Harbinger of Fate and especially the final epic Come What May are sure to get your fists pumping and vocal chords wailing. The ballad-spot is taken by A Gift Or A Curse? which feels very much like a counterpart for The Clouding from the previous album. Jon Schaffer even revs it up on lead vocals and does a good job at it. The experimental nature of this double-CD project is kept up with the flirtations with eastern melodies, the hand percussions, the cello and the occasional flute, for example. The production job is superb throughout the whole record with the guitars having a nice bite, especially when compared to the previous album. The whole band plays tightly and the story (which I will not start spoiling here) captures you in from the first notes from the disc and the first glimpses at the lyrics booklet. The Something Wicked-saga is now seemingly complete, although some additional visual material and possible re-recordings of the first half with Barlow are seemingly coming. The whole massive project is a pleasure for several senses and impresses on many different levels. The only inevitable thought after this kind of a set is that what can possibly be done next? I don’t really know, but I do know that I will take a few hours off for myself, listen to all the Something Wicked-discs together in succession and enjoy one of the finest and most ambitious concept driven album-packages ever like I think they should be: With lots of time, thought and imagination.